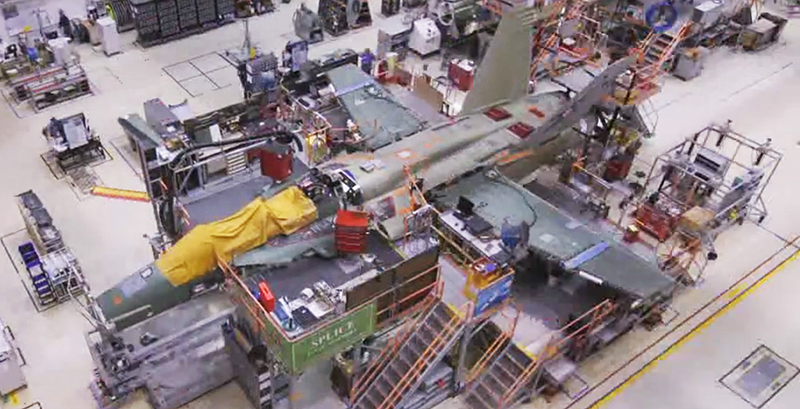 Boeing’s St. Louis plant—once the home of McDonnell Douglas—where aircraft like the F-15, the F-4 and the Mercury and Gemini capsules were born, has been churning out Super Hornets for almost two decades now. And man, do they have the process down. Each Super Hornet costs about $52 million dollars, with the E/A-18G Growler costing a additional $9 million each. The line’s future has been in limbo for years as the Navy impatiently waits for F-35C to become operational, and as foreign orders beyond Australia’s buy have not materialized. But this may be starting to change now, with orders from Kuwait, Denmark, Canada and others up for grabs. The Pentagon also continues to buy small lots of Super Hornets and Growlers to bridge its looming fighter gap and increase need for electronic warfare support. The 2016 spending bill included funds for seven Growlers and five Super Hornets, which should help keep the line open in the near future. Boeing previously stated that it needs to build 24 Super Hornet or Growlers a year in order to keep the line economically viable. This number could decrease if more certainty is offered via the purchasing of long-lead time components, but considering the turmoil in Washington, this is unlikely to happen. If the Pentagon stops buying Super Hornets and Growlers—or does so in such small doses that the line cannot support itself—Boeing could go out of pocket to keep it alive in hopes for future export orders. But as the closure of the C-17 line shows, the company is only willing to afford so much risk when it comes to propping up sputtering product lines. If Boeing cannot find more Super Hornet customers and the line closes, the Navy will be wholly committed to the F-35C and its schedule—even then, it may struggle to fill its fighter gap. Additionally, if the line is shuttered and the F-15 line also is without substantial new orders, Boeing’s historic St. Louis plant will be in jeopardy. This is especially true considering that the company and its partner, Lockheed Martin, lost the Long-Range Strike Bomber contract to Northrop Grumman—a decision that Boeing is currently protesting.